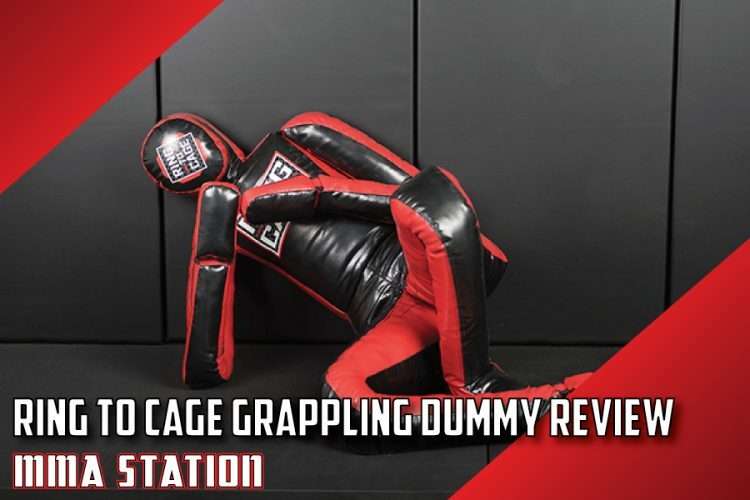 So, you’re looking to get yourself a free standing heavy bag? Awesome! Fortunately for you, Century make some of the best martial arts gear on the market. Throughout our Century Wavemaster review, we’re going to be taking a look at 4 of the different models available, who they’re meant for and whether or not they’re worth the money. We’re going to kick off our Century Wavemaster review by taking a look at the first ever model released, hence the name, the Original. 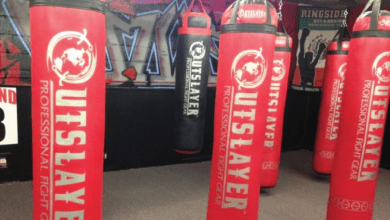 Thanks to it’s long lasting and high quality build, the red Century punching bag is a pretty common site in both gyms and homes across the globe. Whether or not it’s suitable to you, we’ll soon find out. The wide base of the Original can be filled with 250lb of either sand or water. I used to prefer using sand, however it’s a real pain to fill the base with, especially if its’ slightly wet. These days I just stick a hose in the base and turn on the tap, much easier. Whether you use sand or water, the wide design of the base provides with bag with enough support to withstand strikes with a fair amount of power behind them. That being said, if you load up your shots too much, the Original Wavemaster could topple over due to its fairly small design. Considering the Original Wavemaster is fairly small, the padded bag has a fairly large surface area that takes up most of the design. This in turn allows you to practice striking at a variety of different height levels. As is common with most free standing heavy bags these day, the Wavemaster Original possesses an adjustable height feature that allows the bag to extend from 47-inches to 68 inches. What makes the Century Original Wavemaster one of the most sort after heavy bags is its long lasting design. Made using tear resistance vinyl leather, it’s build to endure an absolute beating. On the flip side, the bags outer lining is pretty touch on the hand, so I would definitely recommend wearing either 12oz or 10oz gloves. Unlike a lot of other freestanding bags out there, the Century Original Wavemaster doesn’t have a tonne of padding. Pair this with the tough material I just mentioned and it isn’t the most comfortable striking experience of all time. Again, when comparing the Original Wavemaster to other models on the market, there’s a pretty big difference. The bag is relatively small, measuring just 13 inches in diameter. This means that if you’re a tall person, this probably isn’t the bag for you. Even if you are to adjust the height, the bag becomes a bit more susceptible to falling over. If you’re a taller person, I would recommend checking out the Wavemaster XXL, which we’ll discuss further down in our Wavemaster punching bags review. The bag is also fairly loud, especially when it’s set to its’ maximum height. This isn’t ideal if you live in close proximity to your neighbours or in an apartment. 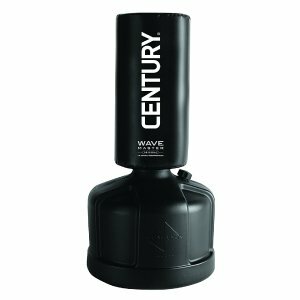 The Century Wavemaster Original is meant for those of you who are looking to work on your technique and cardiovascular endurance. It isn’t really designed for drilling high powered strikes, as it’s both loud and somewhat easy to topple over. Similarly, it is better suited to people of average or short height. As I mentioned earlier, the XXL is better suited for tall builds. This is one of the cheapest models in the Wavemaster range, however don’t be fooled by it’s affordable price tag. The Century Wavemaster Original remains to this day one of the best free standing heavy bags on the market. To be honest, this is essentially the same as the Original Wavemaster, however with a number of changes designed to improve user experience. The first difference between the Powerline and original is the weight of the base. The powerline’s base can hold up to 270lb of either sand or water, which is 20lb more than the original version. This added weight provides more support to the bag and allows it to withstand strikes with more force behind them. Another major difference between the Powerline and the Original is the size. The Powerline has a 17.5 inches in diameter, with a 26inch long surface area. This means that there’s more area for you to practice striking and allows you to throw more of a variety of techniques. One of the most common complaints about the Original Wavemaster was its’ lack of padding. Fortunately, Century took this on board when designing the Powerline and added more foam around the bag. The Century Powerline features an adjustable height system that allows the back to go from 47-68 inches, which allows you to practise a variety of striking techniques at different height levels. One thing Century didn’t fix is the noise, when compared to other bags on the market, it’s still fairly loud. Similarly so the Original version, the bag isn’t that tall and therefore not ideal for taller people. If you’re a taller person, I would still recommend the Wavemaster XXL, which we’ll review down below. When you extend the bag to it’s maximum height, it becomes a lot easier to knock over. Obviously this is expected due to its higher centre of gravity, however just be aware that if you’re loading up your strikes you could knock it over. Having said that, the bags heavier base make it more more stable than the Original version, so it’s not all bad. Although an improvement from the Original Wavemaster, the Powerline’s still designed for people looking to work on their cardio. If you’re looking to work on your explosive power, a larger more stable bag such as the XXL would be better suited. 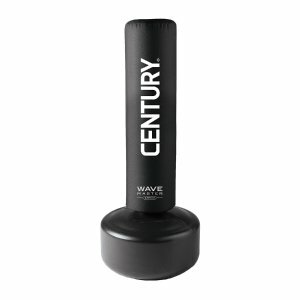 The Century Powerline Wavemaster is priced in-between the Original and XXL models. If you’ve got the budget, I would recommend stretching to the XXL version, however both are incredible bags and worth the investment. The XXL is my favourite model of the Wavemaster line up. To be honest, it could well be my favourite free standing punching bag of all time. It’s insanely sturdy, built to last and provides one hell of a work out. Let’s kick off our Century Wavemaster XXL review by taking a look at some of its best features… which there’s a lot of. Firstly, the XXL is one of the most stable free standing punching bags ever released, I know that’s a big claim but I really believe it. The bag weighs 270lb when filled and thanks to its wide base, is very, very hard to knock over. The XXL also has a massive surface area, being 69 inches tall and 18 inches in diameter, there’s a lot of room for you to throw your strikes. This allows you to circle the bag whilst striking, developing your speed, footwork and movement. I also love how easy the XXL Wavemaster is to set up. All you have to do is fill the base with either sand or water, make sure the bag is secured correctly and you’re good to go. Again, I would recommend water, but it’s really up to you. As with the majority of the Wavemaster line, the XXL is available in 3 colours, blue, black and red. This isn’t such a massive deal as it has no effect on the quality of the bag itself, but is just a nice touch from century. 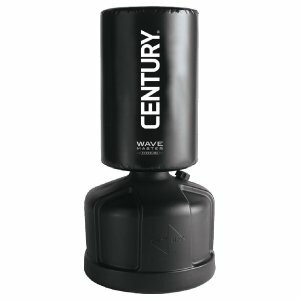 The Century Wavemaster XXL is lined with durable vinyl material and a layer of shock absorbing padding. Despite having a layer of padding, I would still recommend using gloves with the XXL, as repeated blows to your bare fist could cause some unwanted damage. After a few attempts, Century really nailed it with the release of the XXL, however nothing is perfect. Firstly, the bag is the most expensive out of the 4 models we’re discussing today. 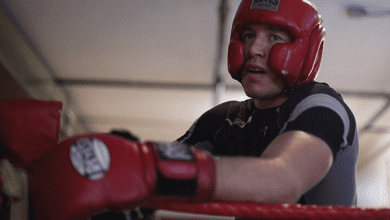 Although costing more, you do get more for your money in both size and quality, however over $200 is a lot to invest in a heavy bag, regardless of its quality. Secondly, the bag itself is pretty large, which is both a pro in con in one. Although providing you with more striking area, it also makes it pretty hard to move. I would recommend setting up the XXL where you’re planning on keeping it. If you do have to move it, you can place it on its’ side and roll the bag where it needs to be. 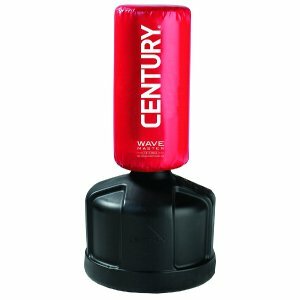 The Century Wavemaster XXL is designed for anyone interested in working out on a heavy bag. The XXL is both tall and solid, which makes it able to withstand high powered kicks as well as being suitable for people of any height. If you’re wanting to work on your explosive power and really load up your strikes, then the Wavemaster XXL is the most suitable for you. The XXL is the most expensive Wavemaster model at the moment, however thanks to its awesome design and high quality build, is worth every cent. Moving onto the final model of our Century Wavemaster reviews, and as the name would suggest, this one’s designed for aerobic work outs. This is by far one of the most affordable free standing bags on the market. 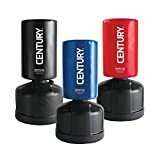 What’s even more impressive is that Century haven’t sacrificed quality in order to release a budget friendly heavy bag. Weighing around 170lb and measuring between 53-63 inches, the Aerobic Wavemaster is extremely easy to move around. This means that you can store store it out of site and easily get it out for your workout. The bag itself features a massive surface area, that when paired with it’s adjustable height system, allows you to throw a variety of strikes at different height levels. The only real drawback of the Aerobic Wavemaster is that it’s not able to withstand the power of full force strikes, especially kicks. To be honest, that’s not really surprising considering it’s designed for cardio work outs, not for training your explosive power. The Aerobic Wavemaster is designed for those of you who are looking to incorporate heavy back exercise into your work out routine. If you’re wanting to throw a bit more force behind your strikes, one of the other models on our list would be better suited. It amazes me just how affordable the Aerobic Wavemaster is. Not only is it durable and long lasting, it won’t break the bank either. 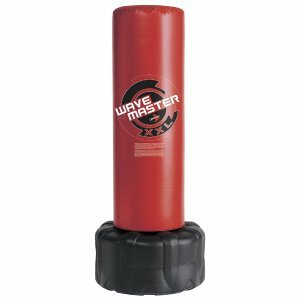 Size: Bag 10.5" Diameter X 40" Tall; Base diameter-22"
So we’ve made it to the end of our Century Wavemaster reviews. I’ll quickly list the different heavy bags we’ve listed and discuss which one’s we’d recommend. Original Century Wavemaster – I would suggest using the Powerline model, as it’s essentially the same, however with a few key improvements. Century Powerline Wavemaster – Highly recommended for drilling a variety of techniques and for cardio work outs. Not recommended for working on your explosive power. Century Wavemaster XXL – The best of the lot, highly recommended for all forms of work out. It’s stable build means that it can withstand the force of kicks without falling over. 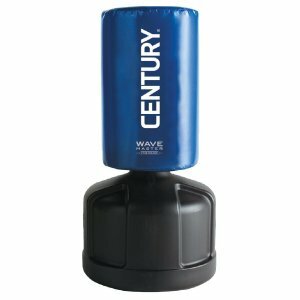 Century Aerobic Wavemaster – Highly recommended for a budget friendly way of incorporating heavy bag exercises into your work out routine. 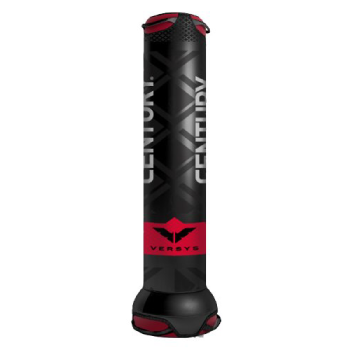 If you're looking for a free standing punching bag that can also double as a grappling dummy, then check out the Century Versys. 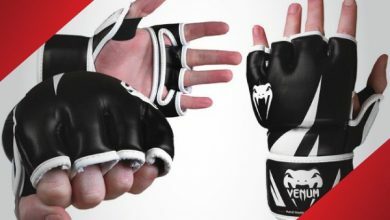 By far one of the most versatile bags on the market, the Century Versys is any MMA practitioners perfect piece of equipment. Built to the same, incredible standard as the Wavemaster range, the Versys is a common site across gyms across the world. Head over to our full Century Versys review for more information. Thanks for taking the time to read out Century Wavemaster Reviews. I hope that you’ve found it helpful and if you’ve got any questions at all, please feel free to comment them below. Product images courtesy of Amazon.com. Featured image by Walmart, adapted by MMA Station. 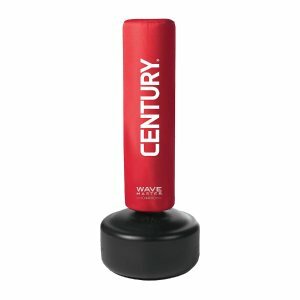 The Wavemaster Range by Century are by far one the highest quality free standing punching bags on the market. 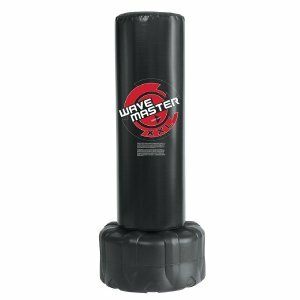 With each model designed with different users in mind, any fitness enthusiast or martial artist can benefit from working out on a Wavemaster heavy bag. Thanks for your Century Wavemaster review! I’ve just received my Powerline model and it’s awesome. I’ve put it in the basement for now and loving it, use it everyday!